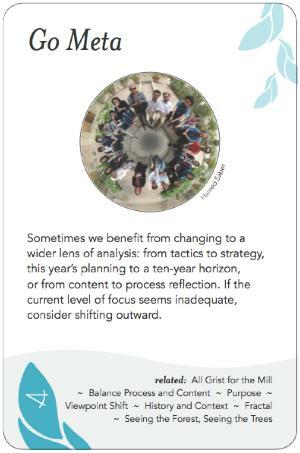 Sometimes we benefit from changing to a wider lens of analysis: from tactics to strategy, this year's planning to a ten-year horizon, or from content to process reflection. If the current level of focus seems inadequate, consider shifting outward. Overuse of this pattern prevents anything from actually getting done. Douglas Hofstadter uses meta as a stand-alone word, both as an adjective and as a directional preposition ("going meta", a term he coins for the old rhetorical trick of taking a debate or analysis to another level of abstraction, as in "This debate isn't going anywhere."). This book is also probably responsible for the direct association of "meta" with self-reference, as opposed to just abstraction. The sentence "This sentence contains thirty-six letters," and the sentence it is embedded in, are examples of sentences that reference themselves in this way.